Join The Higher Learning Team! NASA’s Opportunity rover landed on the surface of Mars in January of 2004. 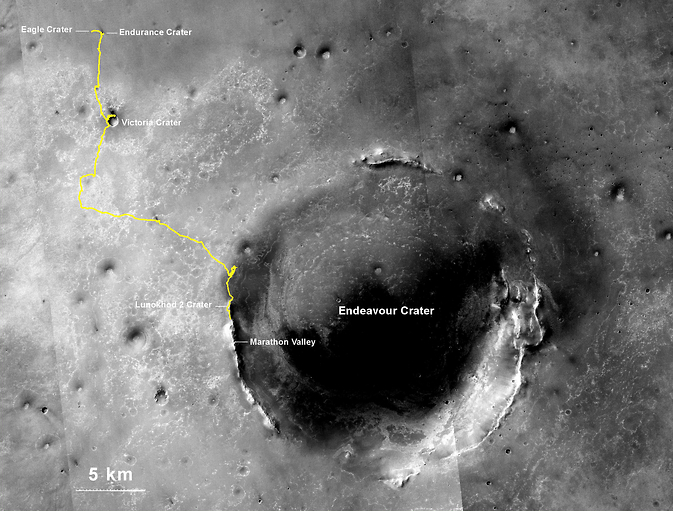 As of Sunday (July 26), the Opportunity rover had driven a total distance of 25 miles (40 kilometers). 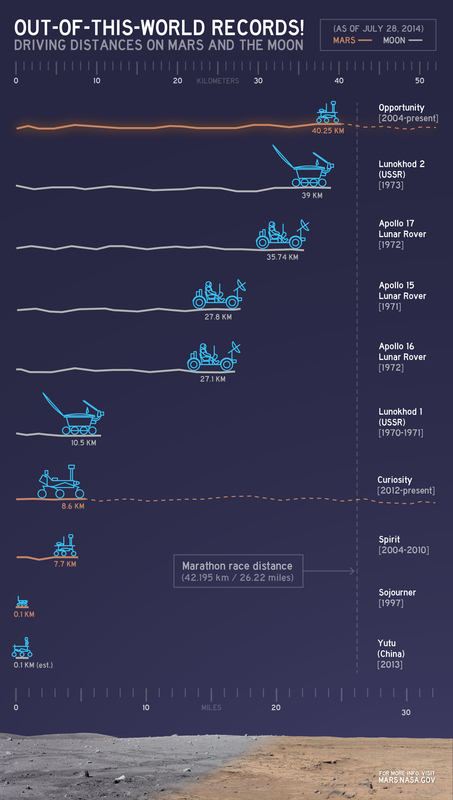 Opportunity took the top spot in total off-world distance traveled by surpassing Russia’s Lunokhod 2 lunar rover, which traveled a total distance of 39 kilometers across the surface of the moon between January and May of 1973. The Russian rover helped to bring about a golden age of space exploration in the 70s. As a sign of respect, the Opportunity rover’s operators decided to commemorate the Russian rover by naming one of the first craters they encountered after it. The Opportunity rover is collecting data on Mars as part of a long-term plan for a manned mission to the planet around the year 2030. Read the original story from NASA here. NASA is confident that underneath Jupiter’s moon Europa there could be more water than in our oceans here on Earth. So naturally, Europa has attracted a lot of attention, encouraging the curious to ask, “Could there be life on Europa?”. Currently, NASA is aiming to send a new mission to Europa by 2025. The White House’s 2015 federal budget allocates $15 million towards making this Europa mission a reality. Europa has recently become one of NASA’s main focuses because, out of all the other planetary bodies in our solar system, it has arguably the greatest chance of harboring life. The video below describes Europa in more detail. NASA hopes that by providing monetary incentives to private parties, they will encourage competition and innovation, leading to affordable development processes for the instruments necessary for new missions like the upcoming one to Europa. Two of the main challenges for teams developing instruments are overcoming Jupiter’s high levels of radiation and making sure that no organic material from Earth (like microorganisms, for example) is introduced to Europa’s potentially habitable surface. The competition ends in April 2015. NASA will select the top 20 proposals, rewarding $25 million to each of the selected teams to further advance their designs for their instruments. NASA will also select eight winners whose instruments will be developed and actually used in NASA’s mission to Europa. Check out NASA’s full guidelines for Europa mission science instrument ideas here. 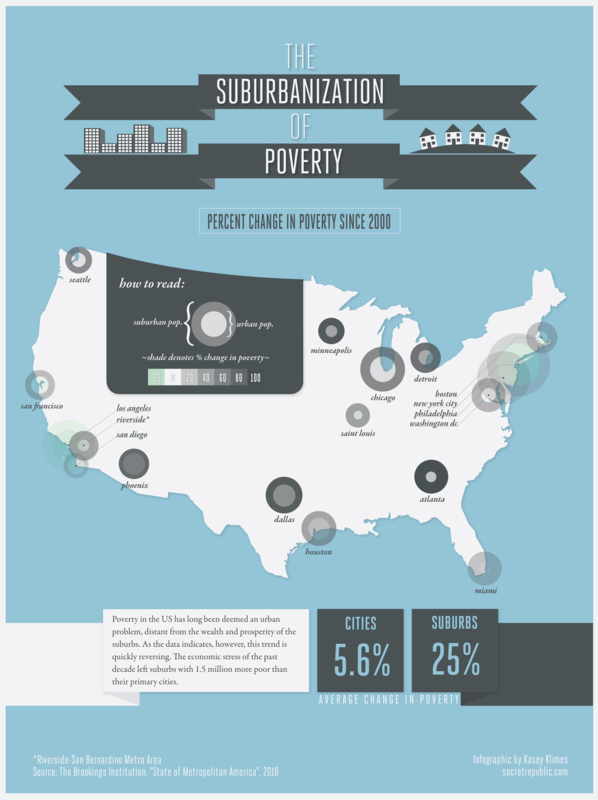 Poverty is often thought of as a predominantly urban problem. The inner city tends to be the most impoverished with wealth generally increasing as you get further and further out into the surrounding suburbs. However, this trend may be reversing. 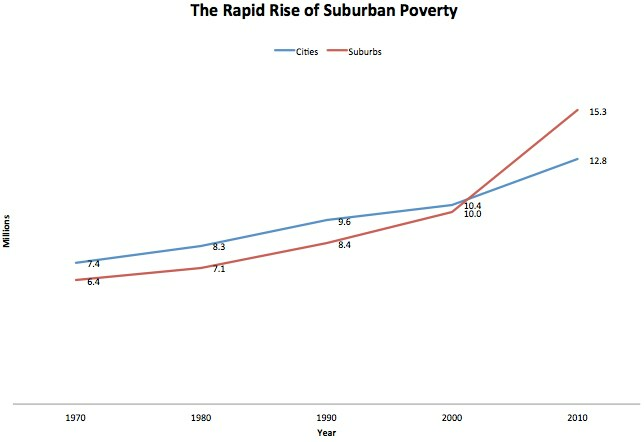 In the decade between 2000 and 2010, poverty in the suburbs rose a whopping 25% while poverty in cities only rose 5.6%. The figures in the infographic above are from a Brookings Institute study released in 2010. A year later, the Institute released another study, this time estimating that suburban poverty rose by 64% between 2000 and 2011. There are a number of reasons for this trend. The first is simply that more people are moving from the cities to the suburbs. The suburbs, particularly in the South, having been growing much faster than the urban areas. With growing suburbs come businesses like retail and restaurants, which employ primarily lower-wage workers. With these new businesses requiring more and more low wage work, more affordable housing options have been emerging in the suburbs as well. As a result, many of the poorer people living in the cities have migrated to the suburbs. The 2000s were the first time the suburban population surpassed the urban population in the U.S.
Another big factor was the recession of 2008, which hit the manufacturing and construction industries especially hard. Both of those industries are based primarily in suburban areas, further increasing suburban poverty rates. To read more about the increasing trend of poverty in the suburbs and learn more about the Brookings Institute’s 2011 report, check out this Washington Post piece from last year. Did you know that many states will give you tax exemptions for flying your hot air balloon, but will make you pay property taxes on it if you leave it in storage? Or that the U.S. has a maximum income tax that’s 3 times higher than Russia’s? BONUS: Most of the countries with zero income tax are in the Middle East. With the rise of modern technology, the look of the classroom has been changing rapidly. Computers are replacing workbooks, iPads are replacing notebook paper, and teachers are increasingly using social media to communicate with their students. The wars in Iraq and Afghanistan have lasted almost 15 years now, costing the United States between $4-6 trillion (with a “T”) dollars since they began back in 2001. A significant portion of that money has gone to buying weapons and munitions for the soldiers. But what happens to these weapons when the soldiers are sent home? 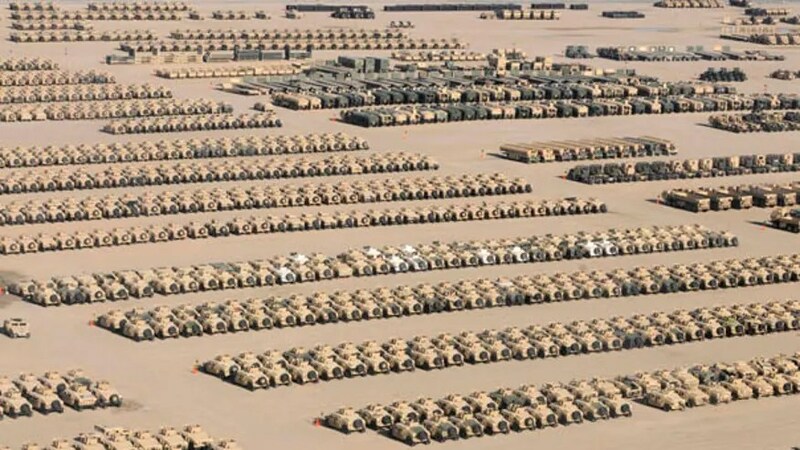 One of these pieces of military weaponry is the MRAP (mine-resistant ambush-protected) armored vehicle. 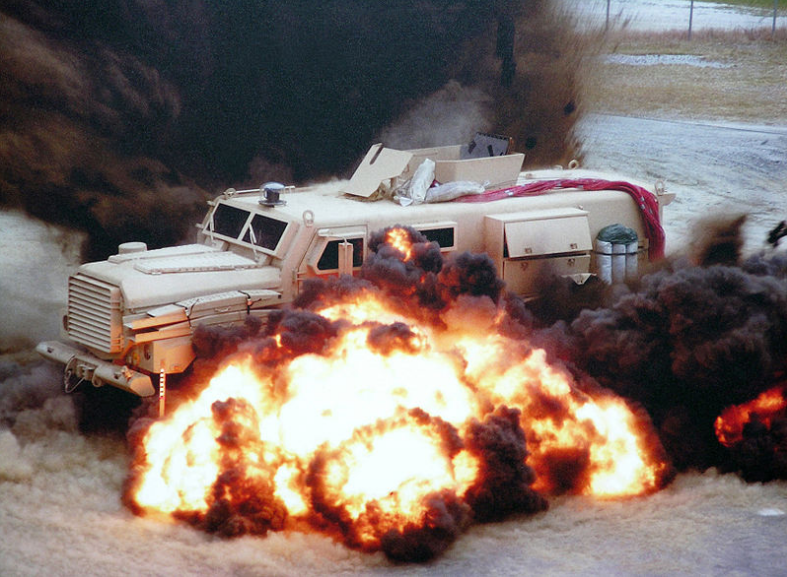 A total of 432 MRAP’s have made their way into the fleets of police departments around the country. The graphic below shows where all of those MRAP’s were sent, as well as giving tallies of the all the military-grade equipment that has found its way into local department since the program started. Click the image to view the full-size version. 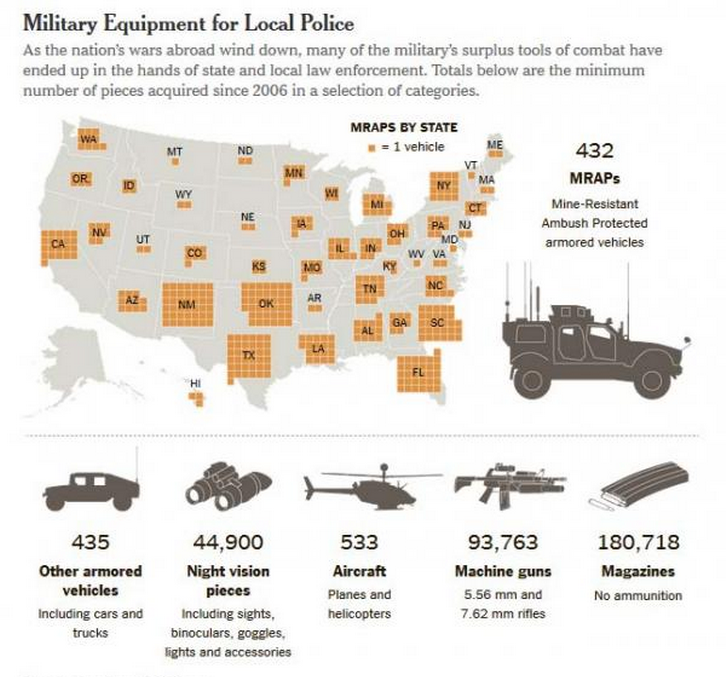 So why are so many weapons flowing into local police forces? Is it because they are facing increasingly dangerous scenarios? Many would argue that this is the case, and while it does have some truth to it, this is simply an excuse. The situation often pits the community against itself. 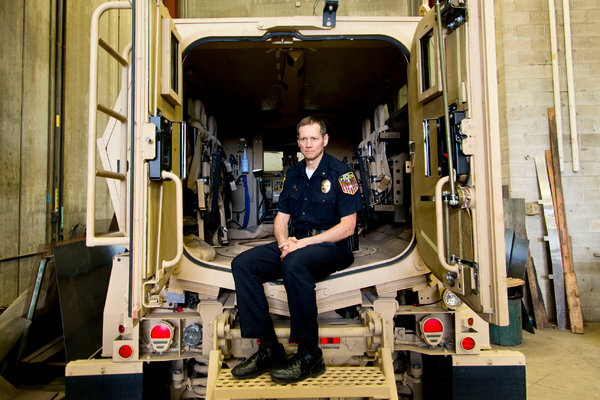 Neenah, Wisconsin, a small city with very low levels of violent crime, is one of the cities set to receive one of the military’s armored vehicles. At the Neenah City Council, Mr. Pollnow is pushing for a requirement that the council vote on all equipment transfers. When he asks about the need for military equipment, he said the answer is always the same: It protects police officers. The biggest problem most people have with this heightened militarization of local police forces is that it’s being done, for the most part, without the knowledge of the public. None of the cities taking in these weapons are holding town hall meetings, public forums or referendums to let the citizens decide whether or not to add fully-automatic machine guns and armored vehicles to the force. I won’t be one of those people who sits here and tells you the government is about to start an all-out war against the people, using cops as infantry, because I just don’t see it. What I will say is that, in my humble opinion, the increased militarization of police forces nationwide is both unnecessary and unsettling. For more info, I highly recommend this New York Times piece– they did an extremely thorough job of covering the whole story from all angles. Our modern society here on Earth depends heavily on just a handful of resources. These resources include fossil fuels like oil and coal, as well as raw minerals like copper, lead and zinc. With the rapid advancement of technology and industry worldwide in the last half century or so, our demand for these raw goods has skyrocketed. 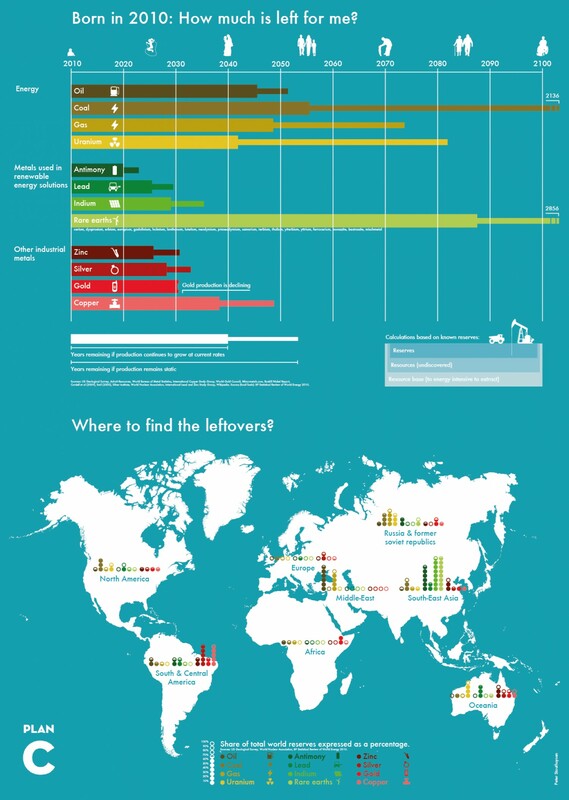 This cool infographic lists some of our most widely-used resources, showing how much of each was left in 2010 and where the remaining resources are located. For the top graph, the longer portion in the middle of each bar predicts the number of years until the resource runs out if it keeps being used at current rates. However, most resources are being used more each year than the year before, so the shorter outer portion of each bar predicts the number of years left if our demand and production continues to increase. Click the image to see the full size version. Click here to be notified of the latest posts via email! Are The Netherlands' Glow In The Dark Roads The Future?